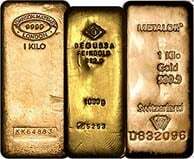 In the UK gold bullion bars are exempt from VAT which makes a 1kg bar a great choice for the gold investor. Wondering what the current price of gold is? You can follow these links to live gold price, weekly gold price and all time gold price. Did you know we offer real time prices but also historical prices back to 1833?